Earlier this year, my kids and I made hiking sticks with paracord wrapped handles. 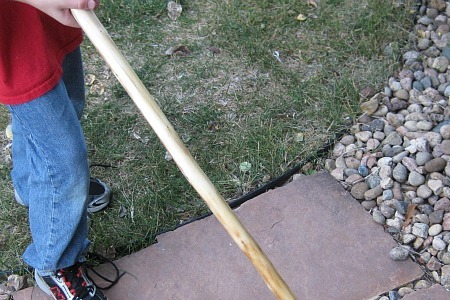 This post details the steps taken to make an aspen hiking stick with a basic wrap for the handle. 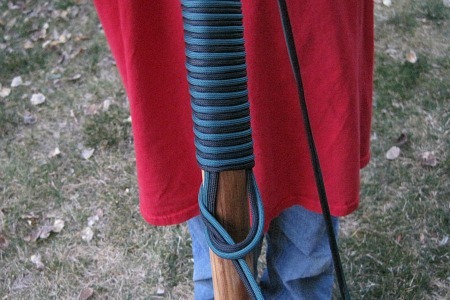 The details of the aspen turks head and maple spiral hitched sticks were published in earlier posts. My kids chose the paracord colors and some parts of the design for their sticks. The wood was straight and had good grain so we went with a simple wrap instead of a more complicated turk’s head or other design. We did decide to dress up the end of the stick with a gaucho knot which looks good and provides an extra hand position when hiking. This type of basic wrap (either single or two color) is a great project to do with kids. Once started, kids can do the wrap themselves. A hiking stick needs to be fairly straight and long enough to allow your elbow to make a 90 degree bend when holding the stick. With a stick selected, the tedious part of removing the bark is the next step. 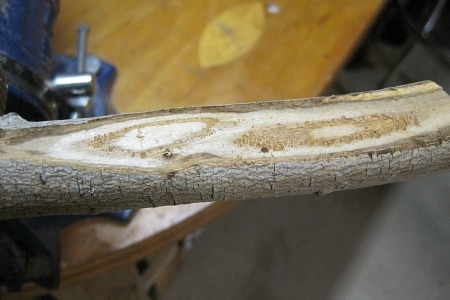 I used a 1″ chisel to remove the bark from our sticks. The key to removing the bark is getting through all layers. After the first layer of bark is removed, it looks complete, but there is still another layer to go through. Each type of wood is different so use a sample piece for practice. After the bark has been removed, sand the stick smooth (which also allows you to cover up your de-barking mistakes) with a medium grit sandpaper and then a fine grit. Once the stick is sanded and smooth, wipe it down with a clean cloth to remove any dust. Then finish it with at least three coats of tung oil. Linseed oil can also be used. This step brings out the natural wood color and gives a protective layer to the wood. After the tung oil is dry, it’s time for some paracord. The two color wrap uses 8-12 feet of each paracord color depending on the length of the wrap. I always err on the side of caution and use longer lengths of paracord. I’d rather have a couple of feet left over for small projects than be six inches short for a time consuming project. I’m left handed so I started with the handle end of the stick on the left side as shown in the picture above. If you’re right handed, you can flip it around and experience some of the frustration us lefties have in trying to follow instructions made by right handers. 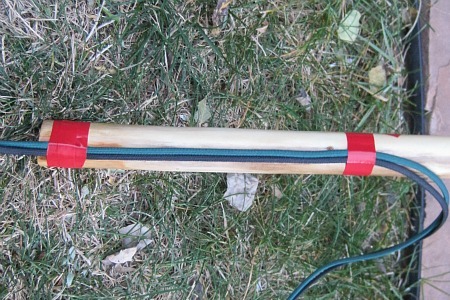 Leave about 3 feet of each color on the left end to tie the Gaucho knot and handle for the hiking stick. Tape the paracord in place with some electrical tape to prevent the paracord from twisting while wrapping. The tape will be removed before the wrap is completed. With the ends of the wrap taped, make a loop with the paracord on the right and bring it back to the left end of the stick. The loop is shown in the picture below. With the long end, start wrapping on the left end of the stick. Start the wrap about 1-2 inches from the end of the stick. This space will be filled in with the Gaucho knot. The initial two or three wraps are critical to the wrap. Be sure to keep them tight and also to keep the loop of paracord that runs lengthwise down the stick straight and tight. If the lengthwise paracord colors separate or twist, it can create bumps and ridges under the wrap which will be uncomfortable to hold. Sorry for the lack of pictures to detail this step. If you have any questions, please leave a comment and I’ll try to describe it better. Continue to wrap making sure to keep each wrap tight. When the wrap is at the desired length, run both pieces of paracord through the loop at the bottom of the wrap. Remove the tape at the bottom of the wrap and then pull the top strands of paracord to tighten the loop. If the wrap was done tightly, it will be very tough to pull the loop tight against the wrap. Once the loop is pulled tight, cut the bottom ends of paracord and melt the ends so they don’t pull back through the loop. I usually try to melt the ends into the loop so they are fused into place. With the wrap completed, the next step is to add a watchband compass to the top of the stick. Before attaching the compass to the stick, a hole large enough for 2 strands of paracord needs to be drilled through the stick just above the top of the wrap. The hole provides a way to route the paracord through and keep the compass held in place. Thread the compass onto the free ends of paracord and place it on top of the stick. Pull the paracord tight and then run the paracord down the other side and route it through the hole that was drilled. The picture above shows what the stick looks like after this step is completed. 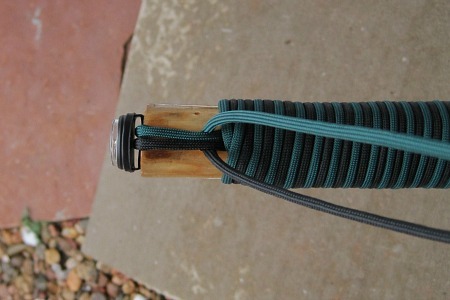 This step can be removed if you don’t want to go through the process of learning the Gaucho knot. However, the stick looks so much better with this extra knot work added and the time spent is well worth it. As usual, I’ll reference Strormdrane for the instruction on making the knot because his work is much better than mine and he makes the knots easy to understand. Both strands of paracord come out through the hole after securing the compass. Only use one of these strands to make the Gaucho Knot. 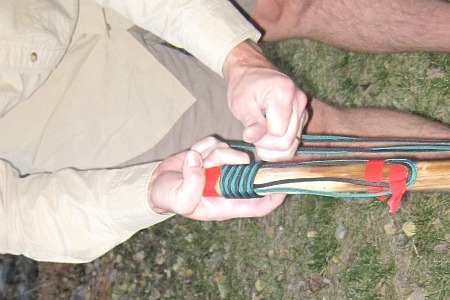 When complete, the paracord used to make the knot should be aligned with the second color that was not used. If they are not aligned, try twisting the Gaucho knot to get them lined up. 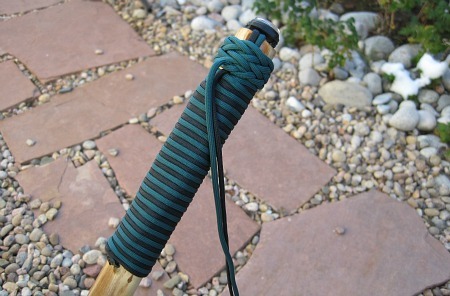 The two colors can then be tied with a cross knot or button knot to make a handle for the hiking stick. Nothing left to do but go hiking with the new stick. Mark, spiral notebooks and those crazy right handed desks are what make us lefties crazy. Glad you enjoyed the post. Scot, glad you like the hiking stick idea. I used maple and aspen sticks that were from trimming trees at my house. The maple was freshly cut and I didn’t dry it at all. It’s bark was much easier to remove. 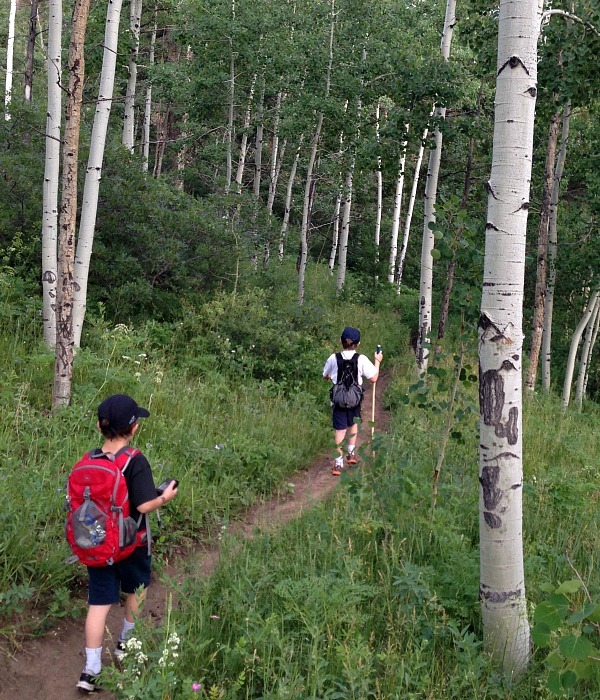 The aspens had been cut for several months and my kids had been using them for light sabers. So I don’t think it matters if they are green and you could use any wood that’s not soft like pine. Hope this helps. This looks like a super fun project!! Definitely something the kids would love to do!! Thanks for the step by step guide! !